• Clogged toilet? Read the best tips to unclog a toilet. Now! Do you have a clogged toilet and water is flushing slowly in your home and no idea what to do? So on this page we will show you several ways to unclog a clogged toilet – and most of the tips will work out within minutes. So fortunately you will not always need a plumber to come in if you have a clogged toilet – and we show you how to fix this on your own. The first important question you have to answer: Has the toilet clogged itself or did you put too much (e.g. toilet paper) in it? So why does your toilet flush slowly? 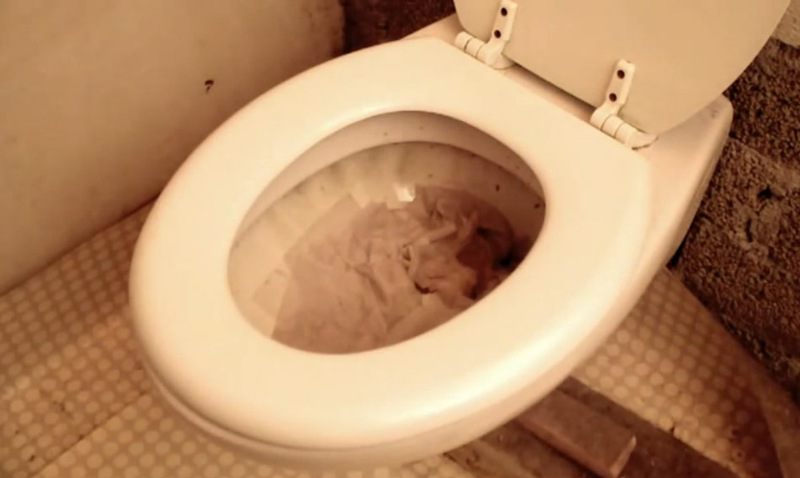 How often did you already flush that clogged toilet? Just once or already several times? Please keep in mind not to flush a clogged toilet too often as you will cause an overflow immediately and flood the whole bathroom or even the whole place you are living in – and this might become a real mess.Please keep this in mind as a severly clogged toilet may cause further problems if you react without mindfulness. The plunger is your best friend when it comes to clogged drains or clogged toilets. The plunger is easy to use and is the most successful way to clear clogs. This is the reason why its also called “Plumber’s friend”. In general the toilet plunger is working with underpressure. If you put the plunger on the toilet drain and start moving the handle up and down you will produce an underpressure / suction in the drain and you will probably remove the clog straigt away. Make sure that the rubber of the plunger covers the whole drain to use it efficiently. You might also consider to run hot water on the rubber part before using it. This will soften the rubber and makes life easier. Now insert the plunger in the clogged toilet bowl. Then start to press it down and pull it back up – but please do it slowly. As said above please make sure to cover the whole entirely. Also assure that there is still water in the bowl as the plunger works best when its covered with water. So add some water to the clogged toilet if needed. If the toilet is sverely clogged please try to move the handle of the plunger up and down ten times each. If this does not help please repeat the process at least 10 times with stubborn clogs. But do not use the plunger too aggressive as this might jam the toilet even further. For a cheaper and even more effective method than a plunger, use a PET or plastic bottle to unclog your toilet. You can do this on your own! Simply screw on the lid and remove the bottom of the bottle using a knife (area marked in read on picture above). Then place the bottle into the toilet drain and pump thoroughly! Thanks to the vacuum that is created in the process, blockages inside the toilet drain are cleared. This method has proven to be very helpful to many of our users! Please note: You should use a medium sized plastic bottle to unclog your toilet. In best case the bottle should be flexible, bendable and squeezable. If a plunger and the plastic bottle do not clear the clogged toilet you should try a drain snake / spindle or plumbing snake next. Advice: Find the right drain cleaner. When you’re dealing with a slow flushing toilet and don’t have a plunger or drain snake at hand, try using your toilet brush to remove the blockage. To do so, apply pressure to the blockage by using the brush just like a plunger. Sometimes this pressure already is sufficient to unclog the toilet. There is another interesting way to unclog your toilet without the use of chemicals: by using a wire coat hanger. Below some very helpful videos with detailed instructions on how to clean a clogged toilet / slow flushing toilet. Don’t miss it! The most common cause for a clogged toilet is the use of too much or the wrong kind of toilet paper. Toilet paper is constructed to resolve quickly in water. It is discharged with the feces through sewer pipes into the sewage system. Using a too high amount of toilet paper makes it harder to come apart and so it swells up instead. When a large amount of paper is exposed to water, it soaks up the moisture. It then rises in volume which causes the drains or toilet to clog up. With solid objects or hair in the sewer pipe, the blockage can be intensified. In most cases, the toilet tank is connected to a U-bend that seals off odor. This seal is possible due to a constant water level inside the U-bend. Usually, this is the spot where blockages occur. Do you have tips on how to unclog a toilet? Write Let us know in the comments. You make an interesting point that a drain snake allows you to penetrate the drain deeper and clear severe blockages. The toilet in our guest bathroom has been clogged for a few days now, and it’s so severe that even the drain snake couldn’t solve the problem. I think we’ll have to call a plumber to come and take a look at it.